Franny Gray and Lisa Horning have been working side by side in Gray's home on and off since 2003, yet this is the first time they've sat down together at the dining table. That's because Gray is a hoarder, and until recently her table was covered with stacks of newspapers and magazines, knickknacks, loose papers, empty water bottles and other odds and ends, all bundled inside plastic grocery bags. Much of that clutter is gone now, thanks in part to the hard work Horning  a member of the housing authority in Framingham, Mass.  has done to help clean up Gray's one-bedroom apartment, sometimes playing the role of bad cop to get the petite 75-year-old to throw out more of her beloved possessions. It's an emotional process, and Gray and Horning have become friends over the years. Horning took what she learned from working with Gray and in December started a hoarding task force that includes a social worker and a therapist. Framingham is one of more than 10 communities that have launched such coordinated efforts in recent months, bringing the number of hoarding task forces to 75 nationwide. These groups, which often draw together local agencies including the police, the fire department and child-protective services, are learning how to deal more effectively with hoarding, a mental-health disorder that affects an estimated 6 million to 15 million people in the U.S. Hoarders are not just monumental slobs. As unlikely as it might appear to an outsider, they have an intense emotional attachment to every object they keep, even the most seemingly ephemeral  like a used Band-Aid. But to neighbors, it's just a lot of junk, and they complain to city officials that homes with chock-full yards or porches are eyesores. Hoarding can also lead to serious public-health and -safety violations. (Think newspapers piled near kitchen stoves or rats infiltrating apartment complexes.) And then there's the cost: a forced cleanout can top $50,000, and that money is rarely recouped from the hoarder, which leaves local agencies to foot the bill. One reason public awareness is on the rise is the proliferation of docudramas like A&E's hit series Hoarders, in which an organizing expert and a therapist, along with a maid service and a cleanout crew, spend two days per episode removing mountains of stuff from a pathologically cluttered home. 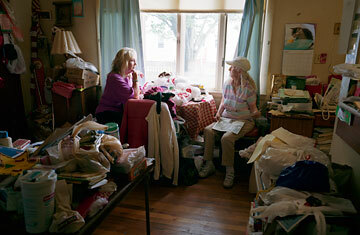 Many of the hoarders featured on the show are in crisis, facing eviction or the prospect that their children will be taken from them. "When we come in, it's sort of like an ER," says Dorothy Breininger, a producer and an organizing expert on the show. "There's not a lot of time to make decisions. Things have to be done  and be done very quickly." The show, which is set to begin its third season in September, has prompted imitators, including TLC's Hoarding: Buried Alive and Planet Green's Gutted. In the latter, a hoarder  nominated for the show by family members and friends without her knowledge  arrives home to find her possessions confiscated. She is then challenged to answer questions about various items in order to win them back and at the end of the episode can either reclaim those treasured possessions or take a cash prize. Read "How to Live With Just 100 Things." See pictures of Americans in their homes.